Selene is back, and she means business in the fifth installment of the popular Underworld series. Today, Sony Pictures has debuted a new poster that puts a gun happy Kate Beckinsale on the firing lines. Will she be able to bring peace in this fantasy thriller? Or will her war continue to rage eternal? We'll have to wait until January to find out. 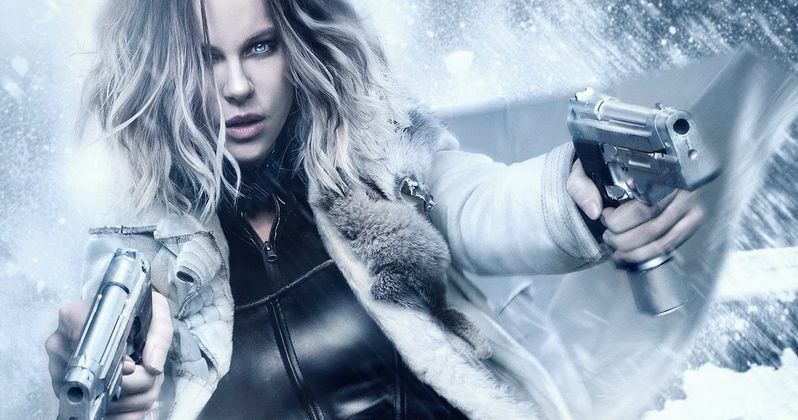 Kate Beckinsale returns as the iconic vampire Selene in Underworld: Blood Wars, the latest installment in the never-ending Underworld series. It is the first new movie since 2012's Underworld Awakening. The story centers on vampire death dealer, Selene, as she fights to end the eternal war between the Lycan clan and the Vampire faction that betrayed her. From the look of things, Kate Beckinsale means business as she fends off brutal attacks from both the werewolves and bloodsuckers who plague her life. With her only allies, David (Theo James) and his father Thomas (Charles Dance), she must stop the dissidence between the Lycans and Vampires, even if it means she has to make the ultimate sacrifice. IMP Awards brings us this new poster straight from the front lines. Anna Foerster directs from a script by Cory Goodman (The Last Witch Hunter, Priest), based on original characters created by Kevin Grevioux, Len Wiseman and Danny McBride. Lakeshore Entertainment's Tom Rosenberg, Gary Lucchesi, Richard S. Wright and David Kern are producing, along with Len Wiseman, who directed the first Underworld movie. Take a look at the new poster for Underworld Blood Wars, which is sure to get you fired up for this awaited sequel.